Lyrics are digested bits of days, remolded in some imaginative lobe-factory during life. I want to tell you about a few of them over the next weeks. I started with Shake Ya, cause it is my first song. Not the first time I put words to music, but the first time it was recognizable as a form. (Imagine several lumped up abandoned mud-brothers to Adam). I was sixteen when the words came, and it took a few years and several tries before it had usable legs. By the time the song was recorded it stood completely on its own. It's filled with jokes to myself, and a story. (in truth every song on Loud Is The Night is imagined as a complete vignette, every character is different). Now, I'm not sure if the actual story is necessary, but there is more than just me now. I can say this song is not about cough syrup, but i did love the commercial. The idea was to tell a story with only the amount of detail necessary for me to understand it, then sonically fill in the blanks with mood as setting. Fortunately I think that's what is best about the song, even if the meaning is hard to decipher it is easy to feel... maybe that's what dayquil picked up on? They were right, the song is about getting better, even if things have to get worse first. The pain of coming down. I don't know why my brain thought this was a good subject to start with, but that's what it fed down to me. Somehow I found myself at the end of a conversation at the beginning of a career. I've played this song an unknowable amount of times, (live/record/practice/in-shower), but it gives me something new every now and then. I am in love with the sound of the final version, Mr. DQA did an awesome job of producing the track. breathing slow cries of life. Though the whole thing was written quickly. I didn't hit me all at once that I had a song I liked. It was a slow couple of days of singing to myself. I don't know how it is for anyone else... there is something terrifying about writing a song to be handed over. I'm still getting used to it. Sometimes I feel like I never will, I've grown to trust my band, and producer, at least enough that my possessive feelings are only momentary. But I felt I had something, and for the first time, wasn't embarrassed to play the song for other people. There is even some amateur behind the scenes you can see too: Here, A good look into the studio. A bit of Dan helping out. 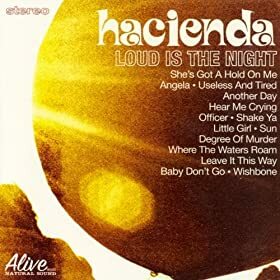 This song, though written early and before I had a solid idea of what we were going to be, is one I turn back to when I think of what Hacienda's sound is. Sparse, but not barren. Detail with atmosphere. I think every song should be a story, and every element should be used to tell it. I'm glad Shake Ya can tell something more than the words alone, which is why it is a song.